Two nymphs – Pleasure and Virtue – who offered him a choice between a pleasant life or a severe but glorious life, visited Heracles, in his youth, he chose the latter. One of his challenges was from King Thespius who wanted him to kill the Lion of Cithaeron. As a reward the King offered him the chance to impregnate each of his 50 daughters which he did in one night (sometimes referred to as the 13th labor). Later Heracles married Megara. Hera drove Heracles into mad fits causing him to kill Megara and their children. Heracles fled to the Oracle of Delphi who was guided by Hera unbeknownst to Heracles. He was directed to serve King Eurystheus for 12 years performing any task required of him. This resulted in the Twelve Labors of Heracles. 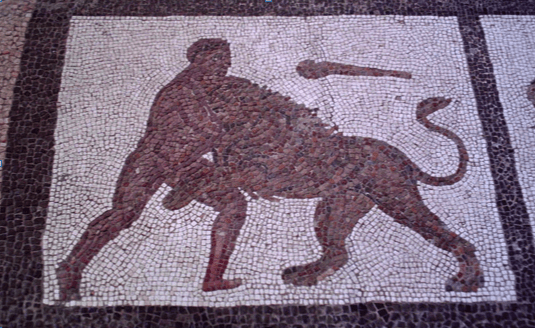 The first labor set by Eurystheus (Heracles’ cousin) was to slay the Nemean Lion and bring back the skin. The lion was usually considered the offspring of Typhon and Echidna. 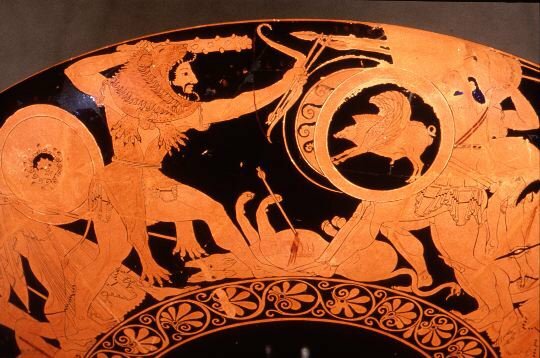 The lion had been terrorizing the area around Nemea, and had a skin so thick that it was impenetrable to weapons. When Heracles first tackled it, his weapons – bow and arrow, a club made from an olive tree (which he pulled out of the ground himself) and a bronze sword – were all ineffective. At last Heracles threw away his weapons and wrestled the lion to the ground, eventually killing it by thrusting his arm down its throat and choking it or by some tales he broke its jaw. 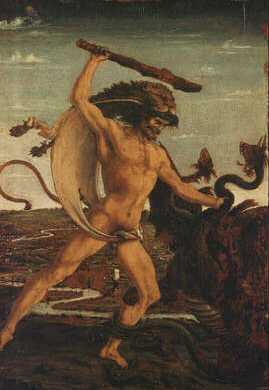 Heracles was becoming disappointed that he might not complete his first task due to struggling to skin the lion. Athena, in the guise of an old crone, helped Heracles realize the best tools to cut the hide were the creature’s own claws allowing him to complete the first task. He would come to wear the hide as armor thereafter. 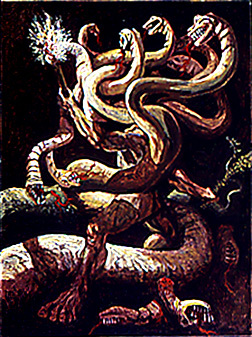 The second labor was to destroy the Lernaean hydra, a sea-creature said to possess so many heads that the vase-painter couldn’t paint them all and it had poisonous breath. Upon reaching the swamp near Lake Lerna, Heracles covered his mouth and nose with a cloth to protect him from the poisonous fumes. He then fired flaming arrows into the spring of Amymone, the creature’s lair, to draw it out. 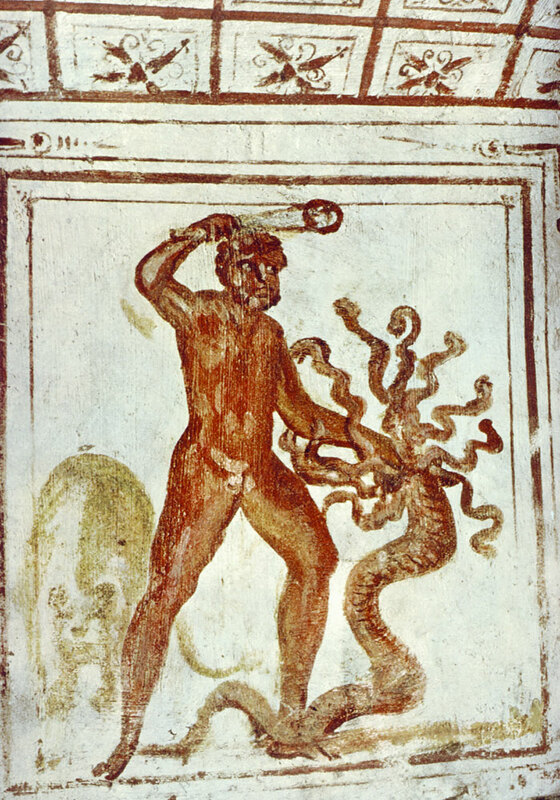 Heracles, wielding a harvesting sickle, attacked the hydra. But as he cut off a head, he found two more grew in its place. Heracles then called on his nephew, Iolaus. His nephew then came to the idea (possibly inspired by Athena) of using a burning firebrand to scorch the neck stumps after decapitation. The creatures own venomous blood was used to burn the heads so they could not grow back. When Eurystheus learned of Heracles’ nephew helping, he declared that the labor had not been completed alone and did not count towards the ten labors set for him. Eurystheus was greatly angered to find that Heracles had managed to escape death on the previous two labors, so he decided to spend more time thinking up a third task that would spell doom for the hero. The third task did not involve killing a beast, as it had been established that Heracles could over come even the most fearsome opponents. Eurhstheus decided to make him capture the remaining Cerynian Hind. The hind was said to be so fast it could outrun arrows. Heracles noticed the hind on waking by the golden glint of its antlers. Heracles chased the hind on foot for a full year through Greece, Thrace, Istria and the land of the Hyperboreans. He captured the hind when it was unable to run any further. Eurystheus had given Heracles this task hoping to incite Artemis’ anger at Heracles for his desecration of her sacred animal. As he was returning with the hind, Heracles encountered Artemis and her twin Apollo. He begged the goddess for forgiveness, explaining that he had to catch it as part of his penance, but promised to return it. Artemis forgave him. Upon bringing the hind to Eurystheus, he was told that it was to become part of the King’s menagerie. Heracles knew he had to return the hind as promised, so he agreed to hand it over on the condition Eurystheus himself came out and took it from him. The King came out, but the moment Heracles let the hind go, it sprinted back to its mistress. The fourth labor was to capture the boar. 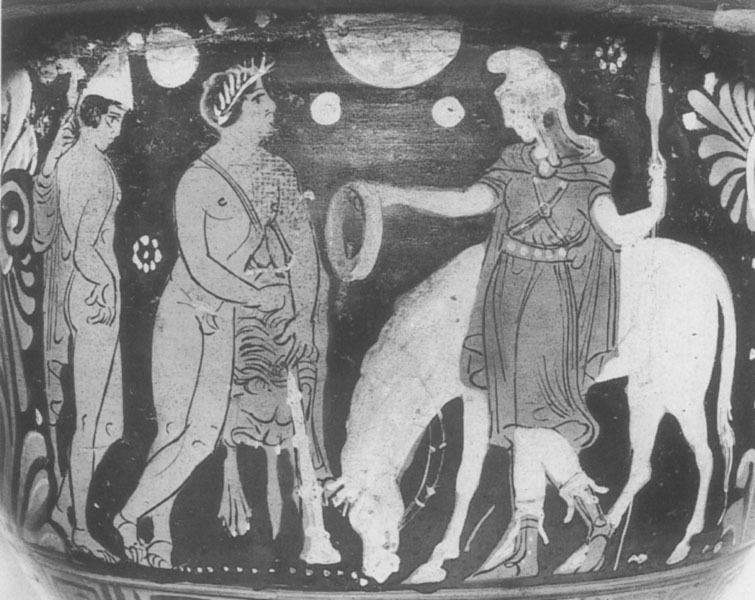 Heracles visited Pholus, a kind and hospitable centaur, on his way there. Heracles ate with him and then asked for wine. Pholus had only one jar, a gift from Dionysus, but Heracles convinced him to open it. The smell attracted the other centaurs that then became drunk on the undiluted wine and attacked. Heracles shot at them with his poisonous arrows causing those remaining to retreat to Chiron’s cave. Pholus, curious about the arrows, picked one up but then dropped it stabbing his own foot. A stray arrow also hit Chiron, who was immortal. Heracles asked Chiron how to catch the boar. Chiron told him to drive it into thick snow. Chiron’s pain from the arrow was so great; he volunteered to give up immortality. Following the advice, Heracles caught the boar and brought it back to the King. 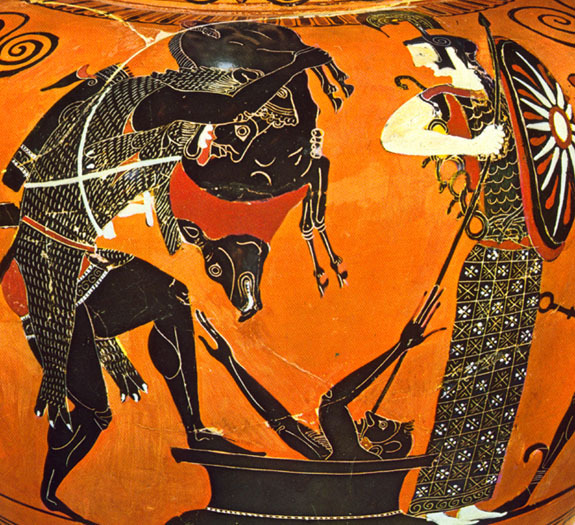 Eurystheus became so frightened he ducked down in his chamber pot and begged Heracles to get rid of the beast. The fifth labor was to clean the Augean stables in a single day. The reason it was set as a labor was to degrade him in the people’s eyes since all the previous labors exalted Heracles and since the livestock were a divine gift therefore immune from disease the stable had never been cleaned making the amount of filth a surely impossible task. However Heracles succeeded by rerouting the rivers Alpheus and Peneus to wash out the filth. Augeas was irate because he had promised Heracles one-tenth of his cattle if the job was finished in one day. He refused to honor the agreement. Heracles killed him after having completed the task and gave the kingdom to Augeas’ son, Phyleus, who had been exiled for supporting Heracles against his father. This labor was set to kill the man-eating birds. They were pets to Ares and had migrated to Lake Stymphalia to escape a pack of wolves. They bred quickly, taking over the countryside, destroying local crops and fruit trees. The forest they inhabited was dense and extremely dark. Athena and Hephaestus aided Heracles by forging huge bronze clappers. The clappers scared the birds into flight and Heracles shot them down with his arrows. The birds that survived never returned to Greece. The seventh task had Heracles sail to Crete where Minos, King of Crete gave him permission to take the bull away. It had been wreaking havoc on Crete. 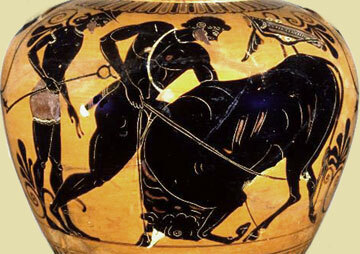 Heracles strangled the bull and shipped it back to Athens. Eurystheus wanted to sacrifice the bull to Hera, who still hated Heracles. She refused the offering because it reflected glory on Heracles. The bull was then released to wander into Marathon. Some tales of this labor say Heracles was to kill the Minotaur. This labor was for Heracles to steal the Mares. In some tales Heracles brought Abderus, one of his male lovers and some other youths to help him. They took the mares and were chased by Diomedes and his men. Heracles was unaware that the mares were man-eaters and uncontrollable. He left Abderus in charge of them while he fought Diomedes. Abdera was eaten. 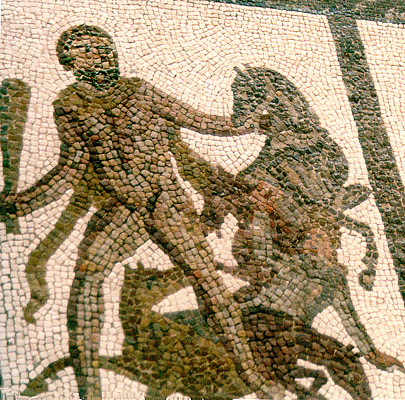 In revenge, Heracles fed Diomedes to his own horses. In another version, Heracles cut the chains binding the horses. Having scared them onto the high ground of a peninsula, Heracles quickly dug a trench through the peninsula, filling it with water, thus making it an island. When Diomedes arrived, Heracles killed him with the axe used to build the trench and fed the body to the horses. Eating made the horses calmer and Heracles took the opportunity to bind their mouths shut and easily took them back to Eurystheus. They were then set free to roam around Argos, having become permanently calmed. The ninth labor was to obtain the girdle at the request of Admete, Eurystheus’ daughter. Hippolyta was so intrigued by Heracles’ muscles and lion skin, that she gave him the girdle without a fight. Heracles was required to travel to Erytheia in order to obtain the Cattle of Geryon as his tenth labor. On his way there, he crossed the Libyan desert and became so frustrated with the heat that he shot an arrow at Helios, the Sun. Helios, in admiration of his courage, gave Heracles the golden cup he used to sail across the sea from west to east each night. Heracles used it to reach Erytheia. As soon as Heracles set foot on Erytheia, he was confronted with the two-headed dog, Orthrus. With one huge blow of his olive club, Heracles killed the watchdog. Eurytion, a herdsman, came to assist Orthrus, but Heracles dealt with him the same way. On hearing the commotion, Geryon came carrying three shields and three spears and wearing three helmets. He pursued Heracles at the River Anthemus but fell victim to an arrow that had been dipped in the Lernaean Hydra’s venomous blood. 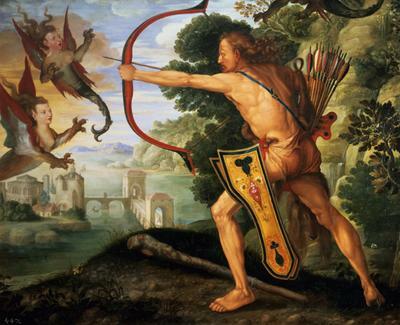 The arrow was shot so forcefully by Heracles that it pierced Geryon’s forehead. Heracles then herded the cattle back to Eurystheus. To annoy Heracles, Hera sent a gadfly to bite the cattle causing them to scatter. Within a year, the hero was able to retrieve them. Hera then sent a flood, which raised the level of a river so much Heracles could not cross with the cattle. He piled stones into the river to make the water shallower. Eurystheus sacrificed the cattle to Hera. Eurystheus discounted two of Heracles’ labor because he was aided or paid, so two additional labors were given. The first of these was to steal the apples from the garden of the Hersperides. Heracles first caught Nereus, the shape-shifting sea god, to learn where the garden was located. Heracles tricked Atlas into retrieving some of the golden apples for him by offering to hold up the heavens for a little while. 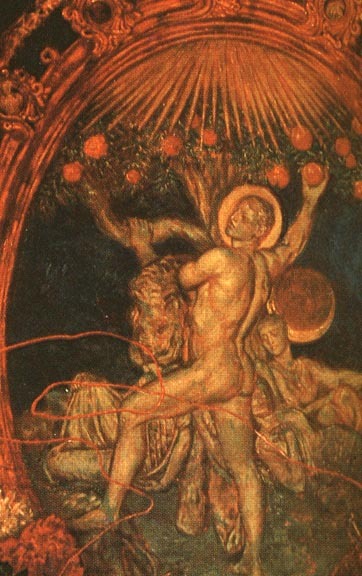 Upon his return, Atlas decided that he did not want to take the heavens back and instead offered to deliver the apples himself. Heracles tricked him again by agreeing to take his place on the condition that Atlas relieved him temporarily so that Heracles could make his cloak more comfortable. Atlas agreed, but Heracles reneged and walked away. 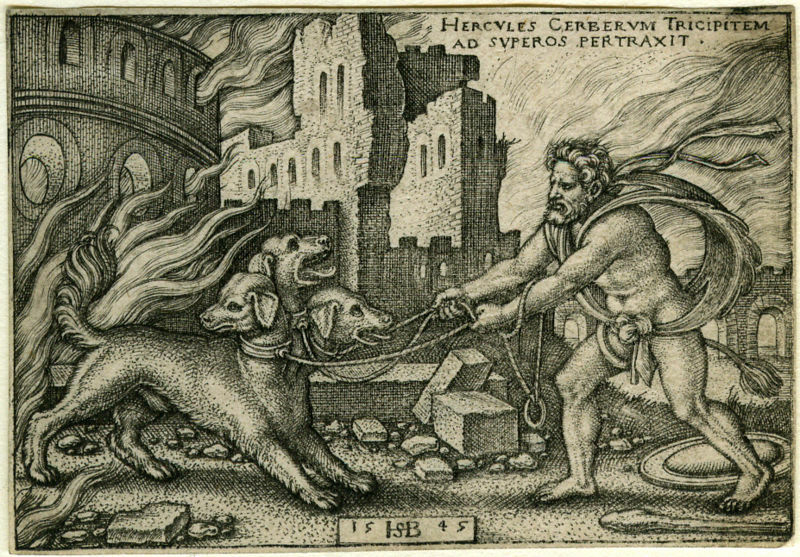 The last of his labors, Heracles was to capture Cerberus from Hades. Hades was the God of the dead and ruler of the Underworld. After having been given the task, Heracles went to Eleusis to be initiated in the Eleusinian Mysteries so that he could learn how to enter and exit the underworld alive and in passing absolve himself for killing centaurs. He found the entrance to the underworld at Tanaerum. Athena and Hermes helped him to traverse the entrance in each direction. He passed Charon with Hermes’ assistance and his own heavy and fierce frowning. While in the Underworld, Heracles freed Theseus but the earth shook when he tried to liberate Pirithous, so he had to leave him behind. They had been imprisoned by Hades because the attempted to kidnap Persephone and were magically bound to a bench. The magic was so strong that when Heracles pulled Theseus free, part of Theseus’ thighs remained on the bench. Heracles presented himself before the throne of Hades and Persphone and asked permission to take Cerberus to which the gods agreed as long as Heracles did not harm the hound in any way. Some say Persephone gave her consent because Heracles was her own brother. Heracles then wrestled the hound into submission and dragged it out of Hades, passing through a cavern entrance in Peloponnese. When he returned with Cerberus to the palace, Eurystheus was so afraid of the fearsome beast that he jumped into the large storage jar to hide. From the spittle of the dog, which fell upon earth, the first poisonous plants were born including the deadly aconite. Shazam Gets New CEO, Gears Up for IPOA little hilarity to end the day with..